Darling and dainty classically colored pink Hawaiian Sunrise Shell necklace! This Sunrise Shell is a beautiful top shell in soft pink and yellow colors, with ruffled ribs, measuring 7/8th inch in size. 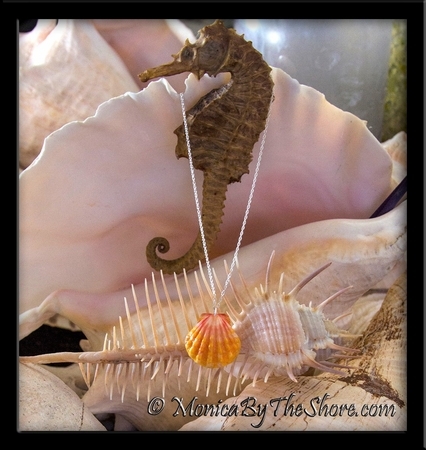 The seashell pendant drapes from a 14 inch sterling silver rope chain necklace. Perfectly beautiful detail in this shell! Suitable for a petite sized woman or younger little lady. 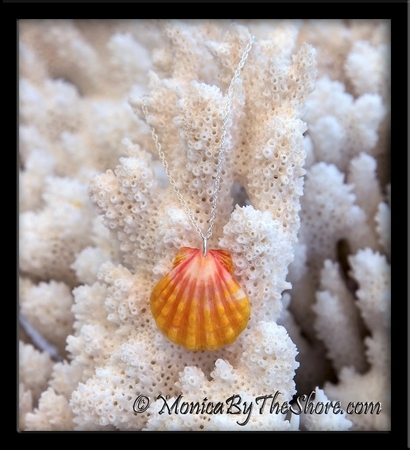 Hawaiian Sunrise Shells jewelry designs by MonicaByTheShore of Haleiwa and Honolulu, Hawaii. Each piece is hand crafted with Aloha on the island of Oahu.